What is the best gaming peripheral we have seen at GDC? Would you believe it if we said a Blackberry phone? 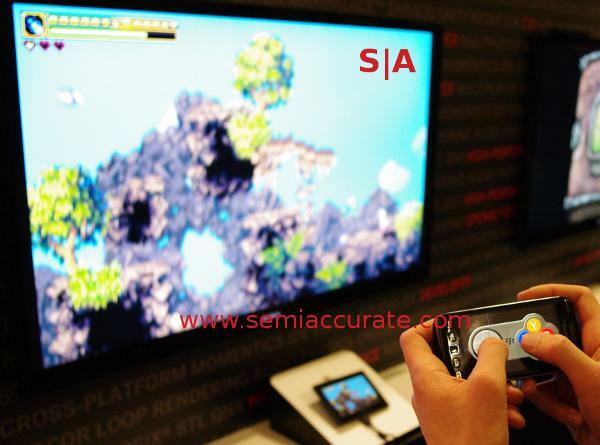 Yes, SemiAccurate spent yesterday crawling both massive show floors at GDC, and we found one, yes one, innovative peripheral. (Note: The little rubber ducky was cute but not ‘innovative’) It was a Blackberry smartphone running a little app that seems blindingly obvious in hindsight. The app was written by a RIM engineer, coincidentally the same one who owns the hands on the device in the picture below. The innovation here is made possible by the Blackberry’s tight synchronization with their Playbook tablet. This allows you to open apps and media on the phone, and have it display on the Playbook. You can then use the Blackberry as a remote control for presentations and whatnot. So far, so corporate. With this little app, instead of a remote mouse pointer, the author turned it in to a D-Pad. Yup, a fully functional touch screen D-Pad as a remote controller for the game running on the Playbook. In the picture above, the big screen is being driven by the Playbook’s HDMI port, but the same concept works for say kids in a car on a road trip. Why did TSMC stop 28nm production?